The Myers-Briggs personality test, also known as ‘Myers-Briggs Type Indicator’ (MBTI), is one of the most popular assessments used in the business world. The goal of the Myers-Briggs test is to indicate differings in psychological preferences and is often grounds for evaluating yourself and besides that your employees. According to the Myers Briggs Corporation, 2 million assessments are administered annually. Keep reading to learn more about the Myers-Briggs test or get started immediately by constructing your own assessment using our tool. Creating your own Myers-Briggs Personality Test is only a few clicks away! Used by over 80% of Fortune 500 companies, it's one of the most used personality tests available. What exactly is a Myers-Briggs Personality Test? The Myers-Briggs personality test is a personality assessment that consists of 16 different personality types. Some are more common than others, but every single personality is unique. The test was originally created by Katharine Cook Briggs and her daughter Isabel Briggs Myers who based their research on the theories of Carl Gustav Jung (Psychological Types, 1921). The Myers-Briggs personality test is universally known and has been around for a while. But did you know that about 88% of Fortune 500 companies use the Myers-Briggs test to enhance their teams and organization? First of all, we have the difference between people who turn inwards (Introverts) and people who turn outwards (Extroverts) when facing a social situation. This dichotomy is also called “Attitudes”. People who prefer extraversion tend to draw energy from an action. They are focused on the outside world, prefer oral communication and are often sociable and expressive. On the other hand, there are people who prefer introversion. They are focused on their own perceptions and tend to think for themselves. Furthermore, they prefer written communication and will only take initiative when something is important for them. Secondly, this pair has a perceiving or information-gathering function. It describes how we interpret information. We can either gather information by observation (sensing) or by trusting our intuition. People who prefer sensing are focused on facts while making detailed and careful decisions. They are not affected by hunches at any possible moment because they only trust information that is based on experiences or wisdom from their past. People who prefer intuition tend to draw conclusions quickly based on their hunch. They are most likely to have more imagination and are often verbally creative. The preference for thinking means that you tend to be more analytical than others. You make decisions as reasonable and as logical as possible and are therefore relentless. Problems are there to be solved, but thinking people resolve problems logically with none to little feelings involved. By contrast, those who prefer feeling look at situations from the inside rather than the outside. They are compassionate and feel a lot of sympathy for others. Their way of working is to weigh down different possibilities in order to find perfect harmony and to achieve a consensus. Last but not least, we have two lifestyle preferences: judging or perceptive. This pair goes hand-in-hand with all other three dichotomies. We could have the preference for using the judging function (thinking or feeling) or for using the perceiving function (sensing or intuition). Both preferences are situated in the outside world (extraversion). People who prefer the judging function are more structured and organized. They tend to reduce stress levels using a systematic way of working and applying deadlines. People who prefer the perceiving function are more spontaneous and flexible. They tend to get energy from time pressure and are often open for changes of any kind. To create your own Myers-Briggs Test, sign up for Survey Anyplace now! ISTJ’s are generally reliable, realistic and reserved people. They tend to work systematically and prefer structure in their work. ISTP’s are generally factual, adaptive and effective people. They tend to remain calm at any time and are capable of taking quick, but thoughtful decisions when facing a difficult situation. ENTP’s are generally imaginative, challenging and upfront people. They tend to think out-of-the-box and have the capability to see specific connections to spot new opportunities. ESTP’s are generally energetic, perceptive and adaptive people. They are great at solving problems in their own, creative way. Furthermore, there’s always a good team spirit when having an ESTP in your team! ISFJ’s are generally loyal, practical and good organised people. They tend to use their common sense and experience to solve problems in a certain way to help other people. INFP’s are generally retained, imaginative and development-minded people. They love to come up with creative and helpful solutions for specific problems and are capable of helping others with self-development. ESFJ’s are generally appreciative, supportive and sympathetic people. They are a typical example of extravert and sociable people. They understand the needs of others and express their appreciation. ESFP’s are generally enthusiastic, playful and cooperative people. They love to have people all around them and keep them entertained. Furthermore, they are true hedonists (enjoying life)! INFJ’s are generally compassionate, thoughtful and empathetic people. They tend to share their vision with others to achieve a certain objective. ISFP’s are generally caring, tolerant and humble people. They love bringing people together and are capable of supporting and encouraging them to achieve a common goal. ENFJ’s are generally responsible, convincing and diplomatic people. They strive for excellent teamwork by getting the best out of each team member. Their ultimate goal is to reach a consensus and to inspire others as a leader. ENFP’s are generally supportive, adaptive and cooperative people. They tend to work on multiple projects at once and see opportunities in every aspect of their life. Their energy and positivity are contagious! INTJ’s are generally strategic, demanding and conceptual people. They tend to develop a long term vision and are capable of resolving difficult situations. INTP’s are generally independent, conceptual and challenging people. They tend to see the world their way (mostly analytic and abstract) and are capable of constructing models for complex problems. ENTJ’s are generally decisive, strategic and self-assured people. They tend to focus on achieving long term objectives as efficiently as possible. They are comfortable with taking a leadership role. ESTJ’s are generally assertive, pragmatic and structured people. They stimulate themselves and others in order to get great results. Furthermore, they have the ability to make final decisions when needed. 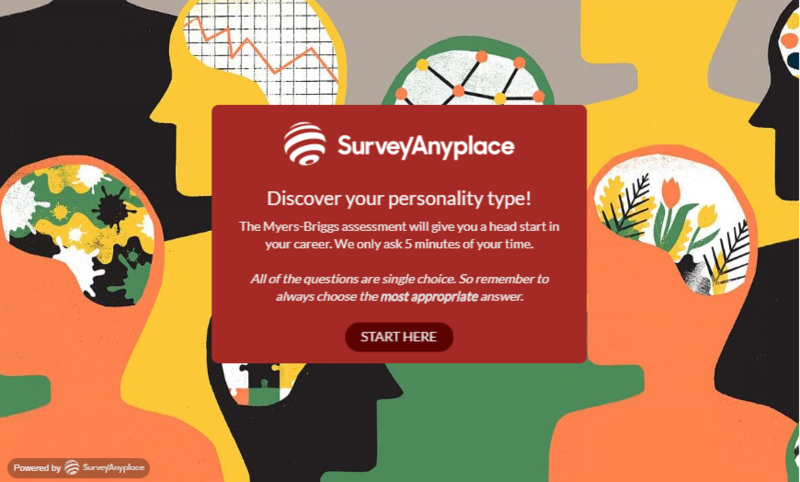 Why use Survey Anyplace to create a Myers-Briggs Test? Find out straight away if a candidate is suitable and automatically provide them with a useful feedback report regarding further training and development. Your company name in the URL, branded emails and branded reports. Feeling pressured by external factors such as a boss, parents, environment, … Make sure to make your respondents feel comfortable with your questionnaire (e.g. by telling them their information will remain confidential). Stage of life: There is always room for self-development during your career. Therefore your respondents can still be exploring their preferences and this can have a major effect on their behaviour, thus also your results. They may be under (a lot of) stress. This can cause them to not behaving typically. Same as with the first reason, you have to comfort your respondents as much as possible. Information gathered from this personality test, can help you to get a better understanding of yourself or even your business and the people around you. It determines your strengths and weaknesses as it promotes self-development. Once your result is determined, you are able to enhance your skills, such as decision-making, time-management, your approach of work and many more! Some businesses use it to establish their teams. For a manager, it’s important to know what type of personalities your employees have in order to manage and motivate them. A team with different personalities need a different approach. With the aid of the Myers-Briggs personality test, you are sure how to collaborate with your team members or employees in a proper, efficient and effective way. Build your own Myers-Briggs Personality Test or any other survey you want!